I'm trying to get more into making my own everyday clothing! Most of the patterns I've accumulated are for dresses, some excessively fancy, so I'm working on reforming in that respect, no longer buying or making summer dresses when I need both casual and work clothes. To start out, I went with a Vogue Easy Options pattern I've had for a while (V8295). The ABC version, with a straight skirt gathered onto a yoke, seemed very unflattering for me, so I started with DEF - a circle skirt on a yoke. I read the chart wrong and accidentally bought too little fabric ... but it was all okay! As you can see from the model, the contrast/matching band around the bottom makes the skirt end below the knee, also a very unflattering cut for many. Ignoring that pattern piece puts the skirt above my knee. The fabric I used is a keepsake quilting calico from JoAnn. 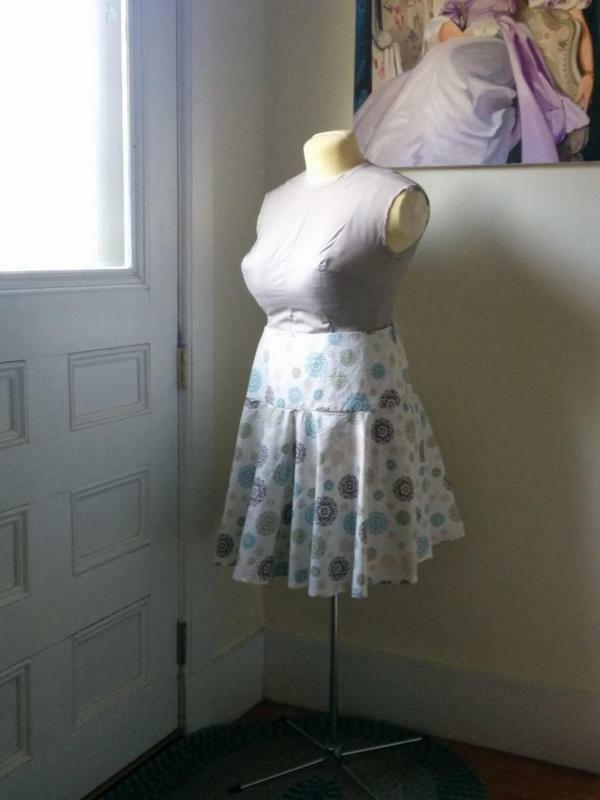 Usually, I avoid sewing with quilting cotton because it doesn't hang well on the body, but a) a circle or A-line skirt can have more body and b) the print is really really cute. Also, it was on clearance at $4/yard. Although I cut my dress form down quite a bit, it's clearly not enough as the skirt does not sit at my waist - it's a little lower. Overall, the project was quite affordable: cheap cotton, pattern from stash, muslin yoke lining also from stash, zipper. Nearly all of the skirt was done on the machine - I sewed the lining in mostly by hand, and had to do the hem that way as well, using my mom's excellent (but slow) iron-into-place-and-pin-and-then-sew method. I haven't actually read Overdressed yet, but I already have a lot of feelings about the garment industry and fast fashion, and I'm going to go on about that for a bit below the cut. The garment industry has always been exploitative: pre-sewing machine, it ran on young women sitting in dark rooms for long hours and little pay. When the machine sped up production, instead of cutting the seamstresses' hours, it devalued their work - literally, it made the value of an individual piece of clothing go down. Which has led us to the point we're at today, where garments are churned out of factories using methods that are fast rather than good and fabrics get thinner every year. As knits - which are easier to fit to different bodies, and which can be made to shape to avoid the time and waste of cutting - predominate, woven fabrics become rarer and prices go down even more. In the past, people simply didn't have wardrobes as large as ours, and they expected to keep their clothes in good condition: when the clothes no longer fit or were out of style, they could sell them to secondhand dealers. Nowadays there's little point in mending clothes when they didn't cost you very much, won't bring in much from a consignment shop, and can be replaced cheaply. It's tough to get around. Shopping secondhand is a good method, though it requires that you have decent consignment stores around you because you're very dependent on what other people are selling; while it does mean you aren't supporting the industry, though, you're likely ending up with the same sort of goods that you'd find at the mall, and you might find yourself still trapped in the cycle of clothes wearing out quickly/not being worth repair/being replaced. The other option is to make clothing for yourself. They'll be more likely to fit properly, you can be sure the quality is good, and the fabric can be any fiber or color you want! One downside is that, of course, you need to be able to sew, but that's more alterable than the state of your local consignment shops. The main downside is in getting the materials. Advertisements for sewing lessons and instruction books in old magazines trumpet the savings in buying fabric and making it up yourself, but that was a different world: today, polyester is everywhere, and it makes the decent fabric seem more expensive in comparison. And the trouble is that you compare the prices of the decent fabrics to the prices of the cheaper retail items and it seems totally crazy to sew for yourself! You have to compare to the better-quality items your finished garment will be more similar to - in which case, you definitely are coming out ahead. But. You only come out ahead if you are only sewing items you would have bought, which has always been a problem for me. When I look at pattern packets, I make grabby hands at the dresses. Not necessarily super formal ones, but ... I don't wear many dresses, mainly just in the summer. If I want to make an actual change in my clothing-buying habits, I need to learn to make things other than sleeveless dresses, namely professional pants, skirts, and knit tops. From now on, I'm being mindful of what patterns I buy - avoiding the pretty sun/party dresses and going for the kinds of clothing I would actually try on in a store and wear to work. (This is assuming I have a work to go to.) I'm not used to making them at all, and I suspect learning to sew pants and knits is going to be difficult, but the only way I'm going to get better is to try, and practice. It's important to remember at times that our foremothers who did sew at home would probably have purchased instead if they'd had the opportunity to find clothing as cheap as ours, and of course my liberal guilt reminds me that I can do this because I have the money to buy fabric, a sewing machine, and the time to sew. And the same goes for the other ancient arts I sometimes like to practice, but that shouldn't stop me from doing it myself when I have the means. In the end, I believe in being mindful of the origins of the objects I use and the food I eat, and in the end I appreciate and enjoy things more when I've been more instrumental in their creation or harvesting. I've been sewing my own clothes, off and on, since I was ten for a Girl Scout badge.. Over the years I've had a mix and oftentimes over 95% of my wardrobe was sewn by me. It was definitely a savings in the budget. It's great how I can personalize my own style instead of being forced into the dictates of what the modernists consider fashion. You're right, the only way to learn is to jump in and do it. I started with simple patterns, and gradually added new techniques as I went along. In my teenage years I even designed a few of my own outfits sans patterns. I find now that the only way I can get clothes which fit me properly is by making my own, so I have the perfect excuse for all my dressmaking! Yeah, I think the main thing that's kept me from buying more clothes (other than, y'know, money) is that I have such a hard time finding things that fit, especially with my high waist. Maybe this will actually make my wardrobe increase.